India in its womb caters a number of beautiful places, cities, hills, and beaches while many of them are explored deeply there are numerous places in India whose beauty is virgin and untouched. India’s outstanding diversity of religions, languages, and cultures is unique and unmatched. You have to come to India yourself to explore it in your own way. Indian government as a part of liberalizing its visa policies introduced ETVs (Electronic Travel Visas) in 2015 thereby making it easier to avail Indian E-Tourist visa for Ukraine citizens. With the introduction of ETVs, the number of foreign tourists visiting India has increased steadily over the period. In 2017 we provided visa service for about 17,000 foreign nationals. Is it possible to get Visa on arrival at India? Unlike the earlier days, India does not provide visa on arrival for foreign nationals. ETVs replaced the visa on arrival systems on November 2015. Effective November 2015 it is mandatory for people visiting India to have a valid visa while arriving at India. Indian government has directed airlines operating flights to India to make sure that passengers to India hold a valid visa before they board a flight to India. What is the difference between an E-Visa and a Tourist visa? An ETV is an electronic travel authorization issued to people who apply for an Indian visa online. E-visa is a shorter validity visa when compared to Tourist Visas. E-Visa can only be applied online and it will be issued within 4 days. Tourist visas are visas with a longer validity of 6 months. Unlike E-Visas tourist visas can only be applied at the concerned Indian Embassies. How many days does it take to get E-Tourist visa for citizens of Ukraine? Be patient once you have submitted the online visa application. The application you submitted will be verified by the officers from the concerned departments of the Indian embassy. If they are satisfied with your application and the supporting documents you submitted your visa will be issued to you in two to four days. If at any point of time the officers are doubtful you will be asked to submit some additional documents to make sure that you don’t miss any important correspondence from the Indian government. According to the official website of the Indian government, one has to apply for an Indian visa 4 days prior to their journey. Considering the chance of delays with the background verification process we recommend you to apply 10 days prior to your journey. How many days is the Indian E-Visa valid for? Indian E-Visa is valid for 60 days from the date of arrival in India. After the immigration clearance passport will be stamped and the validity of the E-Visa will be written down on the passport by the immigration officer. For visas with longer validity and multiple entry benefits, one should apply for a sticker visa at the concerned Indian embassy. How many times can you enter India with a single Indian E-Tourist visa? With E-Tourist & E-Business visas double entry is permitted while tipple entry is permitted for foreign nationals on E-Medical visas. The visas are non-extendable and non-convertible. 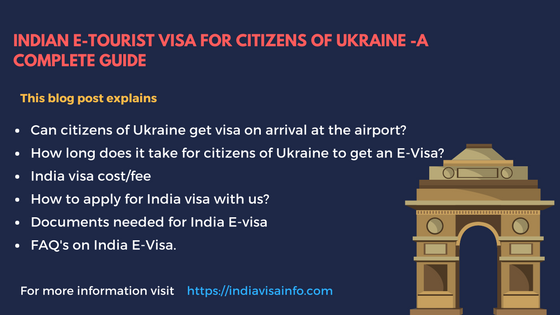 What is the visa fees for India E-Tourist visa for Ukrainian citizens? It costs Ukrainian citizens about ₴1390 as visa application fee. Banks charge an additional 2.5% on this amount as their service charge. If you want to avail our service we charge $25 as our service charge. What are the requirements for India e-Tourist visa for Ukrainian passport holders? You need to keep all the details of your parent’s passport and your work-related information handy. Your sole objective of visiting India must be for recreation (sightseeing or tours) or casual visit to see friends or relatives. (E-Tourist visa is NOT valid for employment purposes and NGO/volunteer activities. If you’re a journalist or if you’re visiting India for a conference, there is a separate visa for that which you can apply directly for at an Indian Embassy). You have a passport that has at least six (6) months of validity from the date of your arrival in India. The passport should also have at least two (2) blank pages for stamping by the Immigration Officer. You must have a return ticket or onward journey ticket, as well as sufficient money to spend during your stay in India. Want to get temporary return ticket to show the immigration officers ? You do NOT hold a Diplomatic/Official passport or Laissez-passer travel document. Your parents or grandparents were NOT born nor have lived in Pakistan. If they are, even if you’re a citizen of the aforementioned eligible countries, you are ineligible to get an online Indian Visa or E-Visa. How easy is it for Ukrainians to apply for an Indian E-Visa? Though the Indian government took a lot of steps towards liberalizing its visa policies they did a very bad job with implementing it. The online portal is poorly built and maintained making it very unreliable for users. One can expect it to crash or become unresponsive anytime when filling in the application form. The main issues arise while making the payment. The banks are ill-equipped to accept the online payments without the chances of the payment failing. If at all the payment fails you get to try a maximum of three times. Failure to make a successful payment in three attempts will result in blockade of your application and you will be redirected to the part one application page. You will have to start filling from scratch again. To avoid all these hassles you can avail the best in the class visa service we provide by filling in the below application form. Our agents will make sure that you get your visa with ease. What if I only want your assistance in making the payment against my visa application, Do I get a discount? We provide a 50% off to customers who want our help only make the payment. You will have to pay us only $25 for this service. Click here to apply for India visa with us. How many times can I apply for E-Tourist visa in a year? You can apply for an Indian E-Visa a maximum of two times in a calendar year. Beyond that, you will need to apply for sticker visa which will be valid for 10 years . Can I enter anywhere in India once my E-Visa is granted? ETAs are also valid for entry at the following three designated seaports: Kochi, Goa, and Mangalore. Separate immigration desks to assist medical tourists are there at Delhi, Mumbai, Kolkata, Chennai, Bangalore, and Hyderabad airports. Once you have the visa, you can leave India (and return) through any immigration point. How long does it take you to confirm our order and get my Indian E-Visa once I place the order? We need a minimum of two working days to procure your E-Visa. Our agents will start working on your visa application once they have all the details they need from you. Whom do I contact to help me with my India E-Visa? Authentic website for eVISA Indiavisa. I am using your services for second time. And in both you guys have delivered good services. Thanks . I was looking for India multiple entry Visa and I found your website very useful to do bookings with. Good professional website for Indian visa I have ever seen. thank you for arranging our visa. Your services in website are very easy to handle and good customer support too. I had applied for the visa on Saturday night and received it on Tuesday afternoon. The entire process was very smooth. Documentation was very simple. I was notified by your team on every step via email and phone. I was great experience. I would highly recommend indiavisainfo.com to others. Thank you guys. Thank you for the support that you provided until I get my visa. I am very thankful for your services. Without your help I may not able to get my visa on time. Very trustful website. I paid full amount initially as I was in a need of visa in hurry. I was little afraid before paying. But after making the payment and sending the docs to them I received my visa in my email within 3 days itself. Really I have a lots of thanks for you. Your services was really fast. Thank you so much for the help.